“I live in a thatched cottage in the beautiful Wiltshire countryside with my husband, our son and numerous cats, dogs and hens. I first picked up a paintbrush in 2010 and decided to make a career from painting soon after. Initially, I wanted to become an equestrian artist as horses have always been my passion. 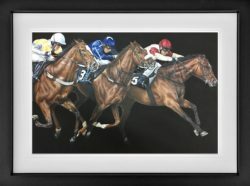 I joined the Society of Equestrian Artists and exhibited with them in 2011 at the Mall Galleries, London, in 2012 at the Menier Gallery, London, and in 2013 again at the Mall Galleries – during 2013 I was also awarded Associate membership with The Society of Equestrian Artists and hope to create more pieces to exhibit with them in the future. 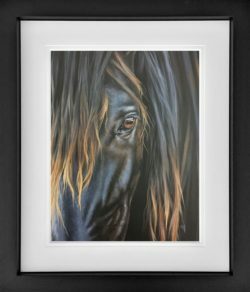 With breath-taking detail, the artist’s representation delves beyond a photorealistic portrayal and seems to be evocative of a transient emotion and, in some cases, the character of the animal. 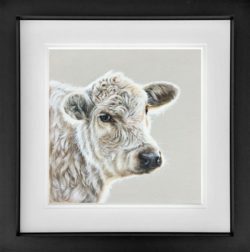 Gina Hawkshaw joined Buckingham Fine Art in 2016 and has increased her portfolio of signed limited edition prints and highly sought-after original paintings. 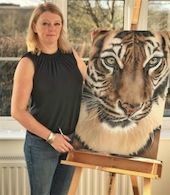 Since taking up painting as a career, Hawkshaw has established her reputation as one of the UK’s most remarkable wildlife artists.